Photo (No. P-36356) and biographical sketch from the Autry National Center. 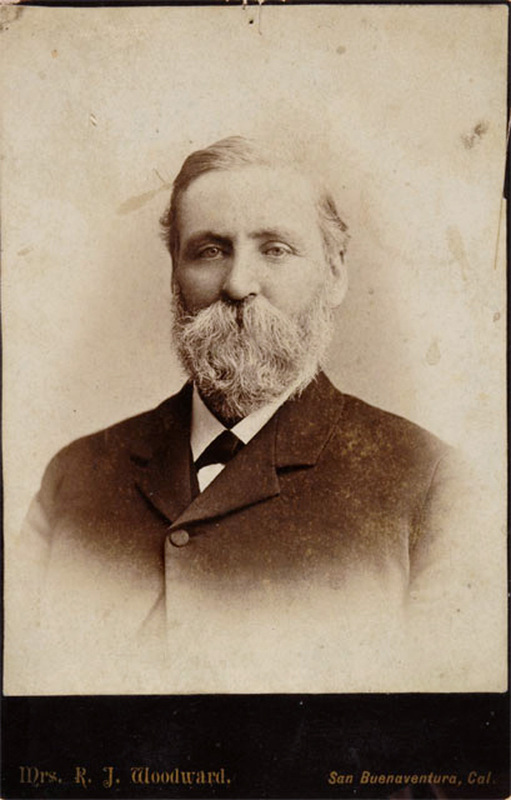 Reverend Stephen Bowers, A.M., Ph.D., was born on March 3, 1831, on a farm in Greencastle, Ind. He was the son of David Bowers and the father of DeMoss Bowers. He was a Methodist minister for 30 years and a chaplain for the Union forces in the Civil War (67th Indiana Infantry). Due to his archaeological interests, especially those focused on Indians around Santa Barbara, Bowers came to California and resided in Santa Barbara and Ventura from 1894 to 1906. On Nov. 17, 1899, Gov. Harry F. Gage appointed Bowers as a geologist with the United States Geological Survey. 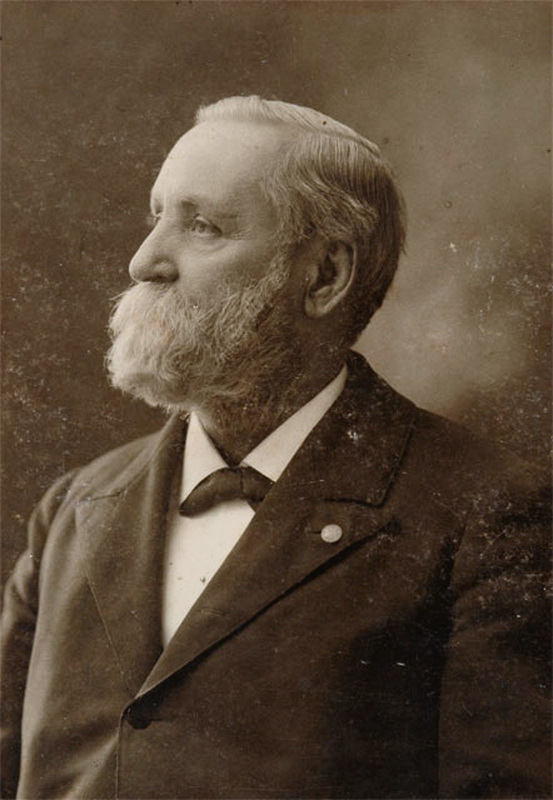 Bowers also held the position of State Mine Examiner of California. He lectured on subjects ranging from the biblical to the scientific. He also served as president of the Ventura Society of Natural History and was a member of the Academy of Sciences in Philadelphia, Smithsonian Institution, and Philosophical Society of Great Britain. Bowers died in 1907 in Los Angeles, Calif. Sometime since [sic] the editor visited a cave in the San Martin mountains, Los Angeles county, which contained some interesting Indian relics. It is in a wild, rugged and picturesque region, and the cave which is one thousand four hundred feet above sea level, situated on the south side of a steep mountain, is difficult to access. It is a natural grotto in a somewhat friable rock, composed largely of small petrified oyster shells, most likely of Pliocene origin. The excavation is about twelve feet deep and sixteen feet long, and not sufficiently high for one to stand upright. The bottom was covered with sand caused by the disintegration of portions of the roof and surrounding walls. In this cavern were deposited nine baskets manufactured from tule, and varying in size from six to twenty inches in diameter. With the exception of the smallest basket, which was found inside of a larger one, each was covered with a neatly fitting cap woven from the same material, and each basket stood on a mat of the same. Three or four of the baskets were in a good state of preservation, while the others were askew, or had been gnawed by wood rats which are abundant in this section, and had constructed a large nest in the cave. One of these baskets contained fourteen notched sticks and eighth of an inch thick, from one to two inches wide, and from ten to fourteen inches in length. These sticks have been painted, some crosswise and others lengthwise, with streaks of red and probably blue paint. 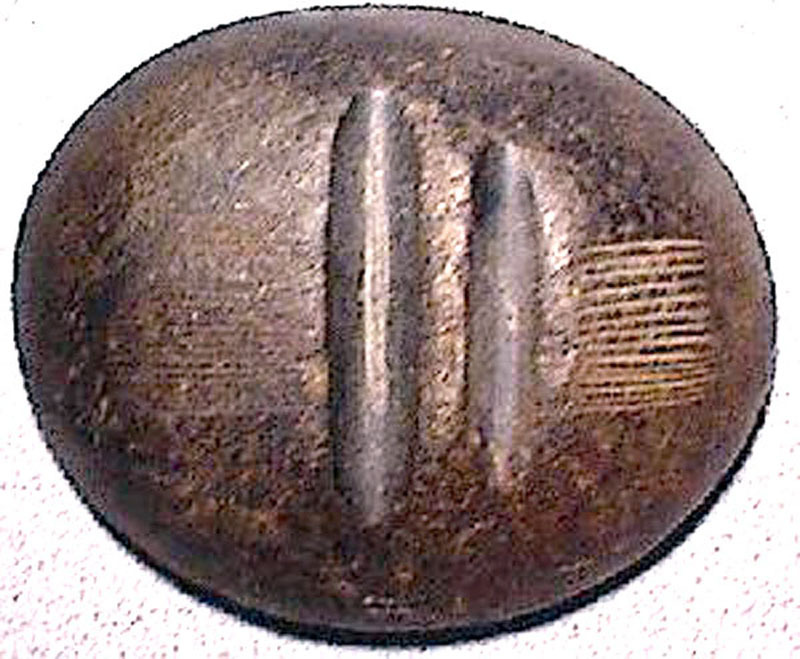 It is most probable that they were used for chronological purposes, each notch indicating a moon or other specific period. Some of these sticks have as many as one hundred notches. They are made of red wood and are perforated at each end. Another basket contained thirty-three head-dresses of birds feathers. The wing and tail feathers of a variety of birds have been used, but the flicker (colaptes chrysoides) predominates. They were made by lapping the quill ends and sewing them together after which the feathers were alternated until the desired length was obtained. These dresses are from five or six inches to nearly a foot in width and from two to five feet in length. Some are plain white while others are more ornamental, being made of different colored feathers. In another basket was found forty-five whistles, made from the tibiae of the deer, about ten inches in length. One end had been cut off and the bone dressed down forming a mouth piece, after which the cellular portion of the bone had been removed and a lateral opening made about three-sixteenths of an inch in diameter opposite which asphaltum had been placed in such a manner as to cause the instrument to emit one or more sounds, when the operator blew in the end. These bones had been wrapped with bark or some other pliable substance and a mass of asphaltum fastened on the larger end into which was imbedded a small piece of haliotis shell. But still more interesting specimens were found in another basket. These consisted of four perforated stone discs or hammers containing handles. The discs are probably serpentine and measure from four to five and a half inches in diameter. The sides have been reamed, in the usual method of perforated discs, leaving the hole much smaller at the center. The handles are of toyon or bear-berry which is amongst the hardest woods in southern California, and are from thirteen to seventeen inches in length. The handles are set a little slanting to the base, or flat side of the disc, and are fastened with an asphaltum cement. Two of the discs still retain paint markings. For what purpose they were intended is not quite clear to us. If for hammers, they are the only ones of the kind of which we have heard in this country. The usual method of fastening the handle is by groove and withe, and not by drilling a hole through the implement. We are inclined to the opinion that these were used as implements of war, or were used in religious rites. But whatever may have been their use they are unique, as far as we know. In excavating the bottom of the cave we found considerable basket work as though it has been covered with this material. A wedge was found made of the base of a deer's antler, 4½ inches long by 1&frac38; inches in diameter, wrapped securely at the larger end with some kinds of cord to prevent splitting when in use. Also a haliotis shell, Haliotis cracherodii, having the holes filled with a cord, and used, probably, for a drinking cup. A shell ornament and portions of deer's antlers, and a serpentine implement for smoothing and straightening the tules for their basket work, were also found. The cave bears no evidences of having been used for a place of residence but simply as a deposit for these specimens, most or all of which have doubtless been used in their dances and religious rites and ceremonies. How long these specimens have remained in the cave, it is difficult to determine. Being perfectly dry and beyond the reach of rain or sunshine they would remain for a great length of time without decay.